The International Bridge at Sault Ste. Marie is the only vehicular crossing between Ontario and Michigan within a 300-mile distance. The Bridge connects two cities, Sault Ste. Marie, Ontario with Sault Ste. Marie, Michigan. Today, the communities served by the bridge boast populations of 14,000 for Sault Ste. Marie, Michigan and 75,000 for Sault Ste. Marie, Ontario. Sault Ste. Marie, Ontario is the largest international trade crossing in Northwestern Ontario. In 1996 almost $1.7 billion in Canadian exports were shipped through the crossing to the U.S., over one-third by rail. Ontario accounted for the largest share of Canadian exports – $1.3 billion or 78 per cent – while Quebec shipped the remainder. Primary destinations for these goods were Wisconsin and Michigan, where each imported at least one-quarter of the total. Minnesota followed with nine percent. The rest of the states imported less than $100 million each. Since the Soo crossing is near the Trans-Canada Highway, it is a convenient route for goods going by truck from Northeastern and Eastern Ontario, as well as Northern Quebec and the Montreal area, to the Upper Great Lakes states. The crossing is connected directly to the major north-south artery I-75 and to Michigan Highway 28, which runs south of Lake Superior into Wisconsin and Minnesota. 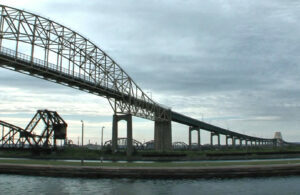 The International Bridge also plays a vital role in the well-being of both Soo communities. It serves as an essential transportation link to the steel, paper and forest industries, to tourism-reliant business, and to the general public for work, recreation, and shopping purposes. An average of 7,000 vehicles per day cross the International Bridge with as many as 10,000 crossing on a busy day.